The reputation we have built throughout all these years is based on our extensive reference list of performed works and the high quality. We have an extensive reference list based on many years of quality and the large number of satisfied clients and partners. Meeting the deadlines for all contractual obligations has also contributed to the successful operation of our company. Continuous monitoring of the application of state-of-the-art materials, equipment and technology has resulted in a series of successfully completed works. ALTAS is a family firm founded in 1995 in the town of Pančevo as a private company. The core activity of the company is design, construction and installation of aluminium and PVC structures in residential, administration and industrial buildings. With its engineering and technical personnel, experienced and skilled craftsmen, as well as offices, workshops and production facilities, high-quality machinery and vehicle fleet, "ALTAS" is a reliable partner for all challenges of the market. Another very important fact is that these profiles also save thermal energy, while their smooth surface makes maintenance significantly easier. The extensive selection of colours will ensure realization of architectural ideas without any obstacles, and therefore architects readily choose this material. In addition to its reliability and excellent insulation properties, they also provide an aesthetic experience, as their sharp and clear lines, as well as the high level of finish ensure modern appearance and luxurious style for your facility. One of the main advantages of aluminium doors and windows is that they show high resistance to weathering and generally high endurance and/or long life. They also provide good thermal and sound insulation – particularly when using those that have thermal break and are properly combined with corresponding glass. In addition to the longevity and reliability, the aluminium doors and windows are renowned for their aesthetical appearance, as well as a more extensive selection of colours which enable fulfillment of different wishes. They can also be used for construction of large elements for business premises, etc. It is suitable for use in areas with high temperatures and intense sunlight. It is easy to maintain, and only needs occasional wiping with a wet cloth. It is environmentally justified, as it is made of a natural material which can be fully recycled and which does not negatively affect the environment and people's health. 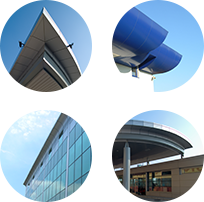 Aluminium profiles are surface-finished, painted and protected by anodizing (anode oxidation) or powder coating. The anodized aluminium is most often painted in stainless colours (from light to dark ones), bronze, golden or natural aluminium colour. Through powder coating, the aluminium can be painted in any colour from the RAL colour chart. The choice is really immense, so the designers and architects face no limitations in designing. Anodizing, i.e. anode oxidation is a protection applied in a thin layer of 15 - 20 microns. This procedure provides a special metallic colour and permanent protection from corrosion. Even though it offers a limited selection of colours, this protection method is very popular due to its attractive appearance and style.